By Aidan Mock: I was on exchange in Perth for a marine biology class when it happened. We were sharing what our favourite marine animals were and an earnest student who didn’t have a background in marine science piped up and said “I know that they’re not animals, but I find corals really cool”. That sentence hung in the air for a moment. And then there was chaos. A summary of the class reaction. In this post, I profile the coral animals that can be found on the Hantu reef and interview a leading coral expert to hear her thoughts on Singapore’s coral reefs. A shot from the Hantu reef. Singapore is home to several coral reefs! While they may not look like the reefs featured in most travel magazines, Singapore reefs are more accessible than we’d realise. Take for example the coral colonies growing along the East Coast Park shoreline. 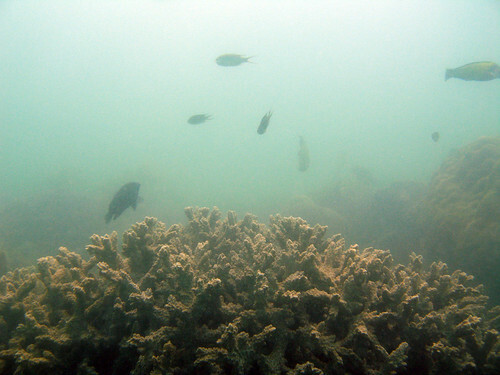 A line of corals along East Coast Park. 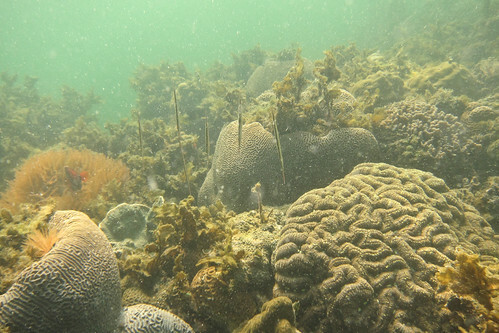 Aside from East Coast Park, there are several other sites along the Southern Shores that are home to corals. OK. So what’s a coral? “When one sees ‘a coral’ under water in their tree-like or leafy or boulder-like forms, what folks may not realise is that it is actually made of thousands of tiny individuals (or what is referred to as the polyp), all clones of one another, which collectively form a coral colony,” Singapore-based coral expert Dr Jani Tanzil explains to me. Individual coral polyps like these come together to form large coral colonies. The confusion of whether corals are plants or animals may stem from the fact that “a lot of corals (hermatypic corals) also live in close symbiosis with algae that photosynthesizes. This algae is called zooxanthellae and its partnership with corals can provide corals with all the energy that they require”. However, corals don’t just get their energy from the sun. The animals also use their tentacles to catch prey from the water, much like jellyfish or anemones do. 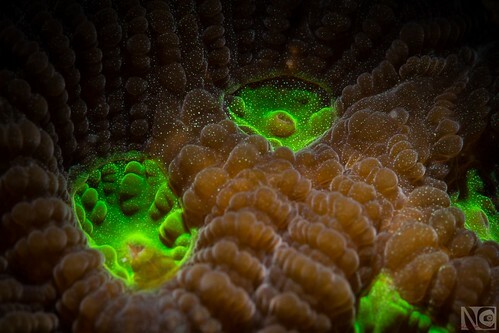 Corals extending their tentacles to feed. OK. So corals get food from algae and catch prey. Why do I care? “Of all Earth’s ecosystems, coral reefs support among the highest species diversity and gross productivity [which] generate goods and services that support millions of people worldwide,” Dr Tanzil shares enthusiastically. “Some of the services that corals provide include food, coastal protection, and tourism. Coral reefs also support more than 25% of the biodiversity in the oceans, including many species of animals that we love to eat (snapper, grouper for your fish-head curry, the fish that comes with your nasi lemak etc!). In today’s economy, coral reefs supports billion-dollar industries.” This diversity is evident on Singapore’s Hantu reef as well, where many animals live in the habitat provided by the reef. Many different species can be seen on the reef including batfishes, clownfishes, nudibranchs, cuttlefish, and a banded sea krait! 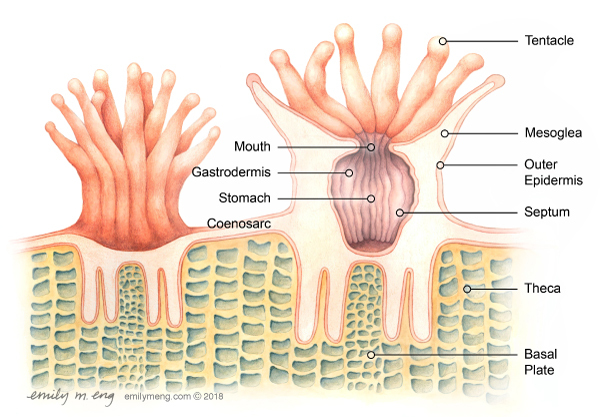 Corals are the HDB of the underwater world, creating large skeletal structures that give a reef shape and stability. Without them, the sea bed would just be a layer of bare sand that supports a lot less life. A bare patch on the Hantu reef. For example, the Acropora corals can create branching tables that grow to be larger than a human. Anchor coral, on the other hand, is reminiscent of bubble wrap and is just begging to be popped (I wouldn’t recommend trying this though). 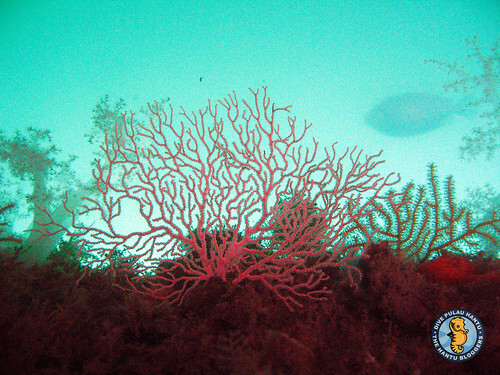 Gorgonian sea fans are an example of soft coral – corals that do not produce calcium carbonate skeletons. I asked Dr Tanzil if she thought that Singapore’s corals were in decline and she responded that “due to increased sedimentation and reduced light penetration, Singapore has lost most of its deeper coral reefs, with few corals found beyond the 6–8m water depths here.” Sediment (loose sand and mud that floats through the water) is created in Singapore by the ships that pass near the Singapore shores and by coastal developments. All the human activity creates a choking curtain of brown, underwater snow that prevents sunlight from reaching the corals. The zooxanthallae in the corals can’t photosynthesize without sunlight and the corals may die as a result. 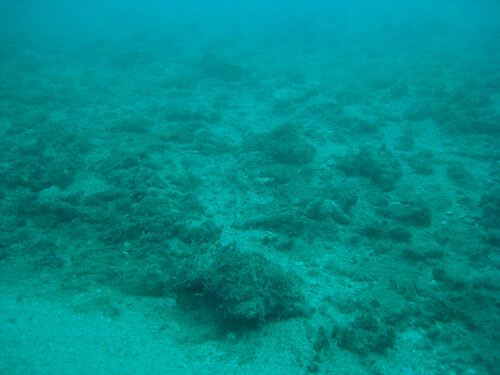 In this video a section of the Hantu reef has already been killed by sedimentation. Globally, corals are also threatened by the El-Nino phenomenon and climate change, both of which cause water temperatures to rise. When the temperature rises, corals becomes stressed and respond by expelling or digesting the zooxanthellae algae that they rely upon for energy. 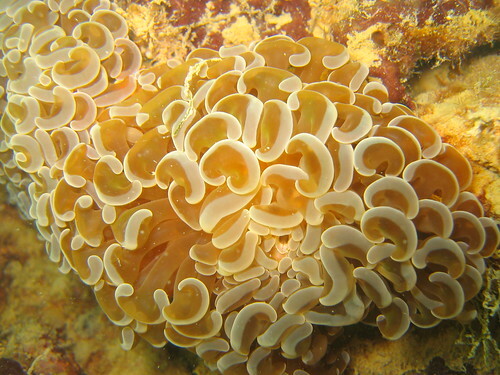 This causes the corals to bleach and if conditions do not return to normal soon, the reef dies. A timelapse of a bleaching reef. Singapore relies heavily on the shipping industry and the country’s lack of land means that coastal developments will likely continue. Additionally, the fossil fuel companies that are partially responsible for climate change also provide jobs and economic support for the country. These conditions means that there are important tradeoffs to consider when advocating for coral reef conservation. In my opinion, there are no easy solutions that can be implemented to protect our reefs and the first important step before advocating for increased protection is to tell the story of our reefs. Few people are aware of their existence and spreading the word that such reefs actually exist lays the foundation for future protection. 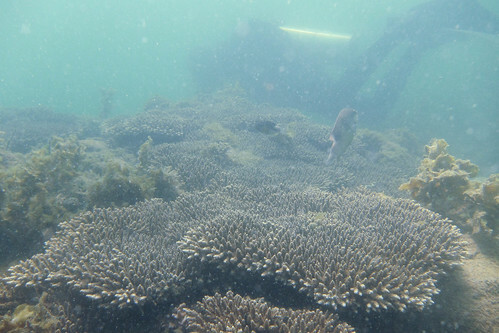 A variety of corals and fish that form the Hantu reef. After all, we cannot love what we do not know. Also, if you’re interested in sharing your thoughts on coral reef restoration in Singapore, NUS undergrad Julian Lopez is currently collating responses. 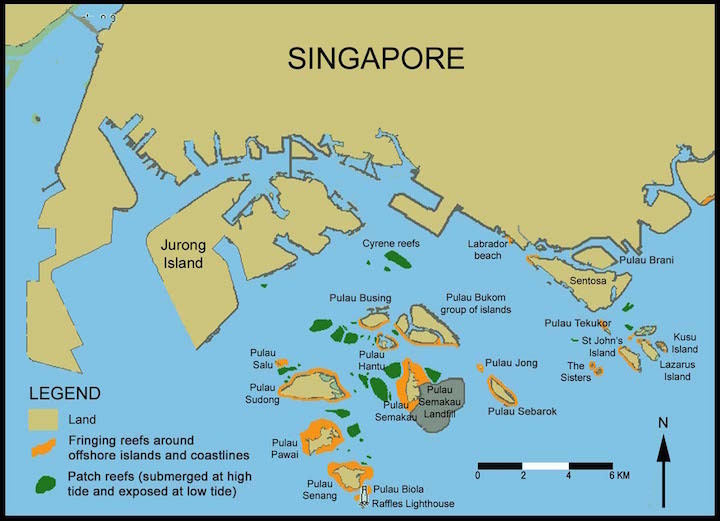 More details here: https://celebratingsingaporeshores.blogspot.com/2018/09/survey-what-kind-of-coral-reefs-do-you.html!